There are three different voice settings; I prefer #1 for my audiobook recording or voice over sessions. It was a bit of trouble getting the settings on programs like Skype to recognize the Snowball as my default microphone, but they weren’t reflective of a flaw in this product. It was simply a matter of forcing Skype to recognize it. I think I expected that it would be difficult to edit the audio files, or capture what it was I wanted to say or record. But, for a small sum of $40 USD, I purchased the AVS4YOU suite of products, which includes a simple audio editing program. This is sufficient for the spoken voice, though I would not recommend it for more complex mixing. There are many other programs that I could review at another time for that; but just for the simplicity of a BlogTalkRadio program, creating a Kickstarter Video, or just recording your memoir, this will do the trick. Pamela, a companion program to Skype is just perfect for recording phone calls that I initiate or receive through Skype. and this program easily recognized the Snowball as my stalwart companion as well. 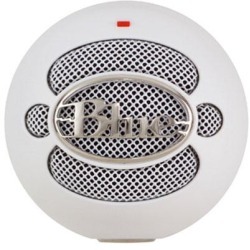 Blue has other versions of microphones available, some are shiny, and have a lot more features. But, I wanted something that was simple, high quality yet it wasn’t intimidating. I was so pleased to discover an electronics company that just did their job the right way, the first time, and charged a fair price.